"Sweet Delights" is my new cupcake painting which is listed on eBay. Three delightfully delicious flavors of cupcakes are displayed on a charming white cake stand decorated with red berries. Heaping piles of cream cheese frosting tops each cupcake along with red candy decorations. Decorative tags are painted on each cupcake with the flavor printed in the center. A red and white checked bow is glued to the cake stand. A couple of weeks ago, I had a baby shower for a dear friend's daughter. My friend has been blessed with two absolutely adorable grandson's in the last year and a half. Then she got a call this week with the news that once again she is going to be a grandma in nine months. I'm happy to hug and kiss on her grandbabies and to be called Aunt Cathie. I hope I'm blessed with such sweet ones some day. Here are a few of the treats we served that day. We made Onsie cookies, petits fours, and Life Saver pacifiers. I got the idea for the pacifiers from Paula Deen's magazine. They are put together with two life savers and a jelly bean. Glue them together with royal frosting and add a cute ribbon. See the snow on my deck through the back door? We got about four inches of snow that day. I made a Noah's Ark banner for sweet baby Joseph. and a Noah's Ark diaper cake center piece. God has truly blessed this wonderful family! I love the new cupcake painting and all the baby shower goodies!! That cupcake painting is just adorable! I love it to pieces. I know so many people in blog land that have cottage kitchens and this would look perfect in each and every one of them! The baby shower looks like it was a great success. Those cookies are cute! Congrats to your friend on her grandsons and the new baby to come. Sounds like a very exciting time for her family. Your painting is delightful. It would look wonderful in a kitchen or in a bakery. Oh my goodness your also a party host extraordinaire! Is there anything you cannot do? I just love the lifesaver dumies! Yummy! Makes me want chocolate. Thank you for your comment on the painting. It is refreshing to have all these crab shanties so close. I have just scratched the surface here on the Eastern Shore of Maryland. My camera is a hand me down from my better half, a D-200 Nikon digital. She works with a D-300 and D-700. Both are Nikon digitals. 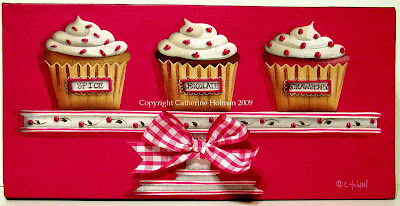 Oh Cathie, I love that cupcake painting...love it!!! And the colors are so perfect! 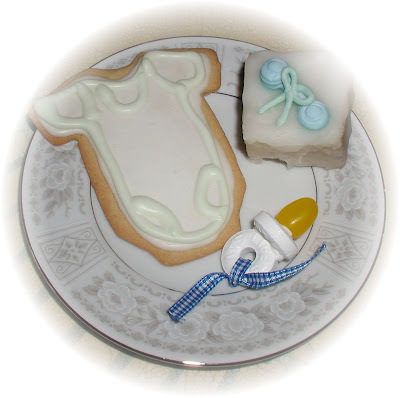 As Aunt Cathie you outdid yourself with the adorable Baby Shower treats. The cookies and pacifiers are adorable and the cake and banner are so special. How creative! Thanks for the shower ideas. I am hosting a double shower for 2 of my cousins and I love the Live Saver pacifiers!! I just love the banner you made for baby Joseph, Mommy will be able to put it up in his nursery. Wow you really made the shower extra special by all your creative touches. A very happy day indeed. What cute ideas for a shower! I am going to "steal" the pacifier idea! I love it. I am having my daughter's baby shower in May and those would be so cute to have sitting on the tables. Your cupcake paintings are beautiful as always!